Rhinoceroses – also called rhinos – are one of the largest mammals roaming the world today. Once found throughout Asia, Europe, and Africa, the rhino population is rapidly shrinking. Fortunately, wildlife federations are doing their best to save these interesting animals. Let’s learn more! What do rhinos look like? After elephants, rhinoceroses are the largest land mammals in the world. There are five species of rhinos: the Black Rhino, White Rhino, Sumatran Rhino, Javan Rhino, and Indian Rhino. Depending on the species, rhinos are five to 13 feet in length. They range in weight from 1,300 to 7,000 pounds. 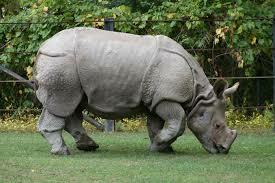 White rhinos and Indian rhinos, also called greater one-horned rhinos, are the largest. All five species have large bodies, stumpy legs, and horns. Black, white, and Sumatran rhinos have two horns. 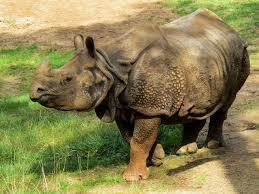 Indian and Javan rhinos have just one. Rhinos also have thick, leathery skin that is a gray-brown color. Despite their names, black rhinos are not black and white rhinos are not white. Rhino hooves have three toes and are used to scratch the ground in order to mark territory. They also help rhinos comfortably cross rough terrain (land). 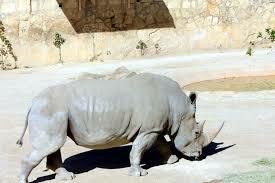 Rhinoceroses live in parts of Asia and Africa. They can live in various habitats, including savannas and forests. Black and white rhinos are found mostly in the southern and eastern parts of Africa. 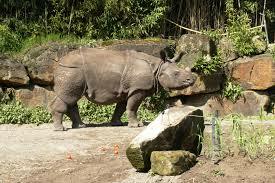 The Sumatran rhino lives in Indonesia and Malaysia. The Javan rhino can be found in Vietnam and Indonesia, while the Indian rhino lives in Nepal and small sections of India. Rhinos are herbivores, meaning they eat only plants. 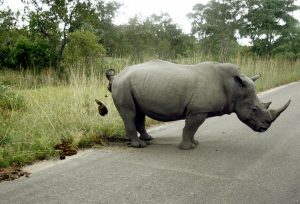 Most rhinos eat leaves, buds, and shoots from trees, bushes, and other plants. White rhinos have unique square-shaped lips that are perfect for grazing on grass. Rhinos are usually solitary animals, meaning they prefer to live and travel alone. White rhinos are the most social of the rhino species, but all rhinoceroses like to have their own territory. However, their home ranges often overlap. Rhinos may share watering holes and feeding grounds with one another. Rhinos mark their territory and will fight other rhinos who intrude on their space. Males are especially aggressive with other males. They will usually allow females into their territory. Females require about 1-4 square miles for their territory, while males require just 0.3 to 1.5 square miles. This is because males roam more frequently than females. Female rhinos have a pregnancy of 14 to 18 months before giving birth to a rhinoceros calf. Rhinoceros calves can weigh over 100 pounds! They can stand up and walk just minutes after being born. Although rhinoceroses usually prefer to be alone, female rhinos are very loving and attentive to their calves. The calf stays with its mother for two or three years before going off on its own. The young rhino must be able to compete for space with other territorial rhinos. 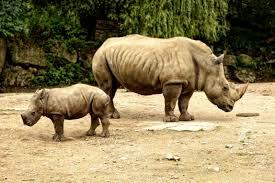 Male rhinos usually leave their mothers earlier than female rhinos. The black rhino, Javan rhino, and Sumatran rhino are critically endangered. The Indian rhino population is slowly increasing. They are considered vulnerable. The white rhino has the most stable population and is classified as near threatened. Rhinos are hunted for their horns. Their horns are believed to have medical properties and are considered a symbol of wealth. For this reason, poaching is a major threat to rhinos. Rhino horns are so valuable that poachers use helicopters, night vision goggles, and other advanced tools to hunt them. Rhinos are also suffering from habitat loss. Because they are so territorial, there is a limit to the number of rhinos that can survive in any given area. As their habitat shrinks, this is becoming a big problem. Most rhinos currently living today are in protected areas or reserves. The World Wildlife Federation is working to save the rhino. Rhinos can live for up to 35 years in the wild. They can run up to 30 miles per hour. Rhinos have a great sense of smell and hearing, but very poor eyesight. They sometimes charge for no reason or accidentally charge into trees. Although rhino skin is tough, it’s also sensitive. They’re often bothered by sunburn and bug bites. They wallow (roll around or lie in mud) to help protect their skin. Rhino horns grow back when trimmed or removed.